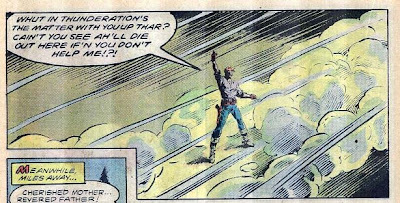 Matching Dragoons: Jonah Hex #79 "Duel in the Sand!" Jonah Hex #79 "Duel in the Sand!" 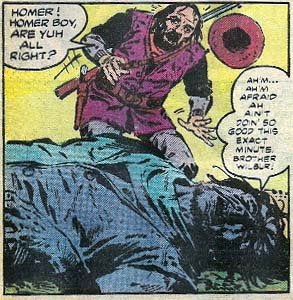 Jonah stops to offer a stranger a drink from his canteen, unaware that he has been set up by Homer & Wilbur so they can collect the bounty on the head of Jonah Hex. Jonah hears the click of the rifle pointed at his back and he starts to dodge but isn't quick enough. He takes a bullet in the side as he dives from his horse. Jonah swiftly draws his pistol and shoots Homer right between the eyes. Wilbur opens fire and Jonah is barely able to mount his horse and ride off. Wilbur comes out of hiding and runs to his brother. But sadly, his brother has been shot dead center between the eyes, so he is only able to get out two whole sentences before he expires. 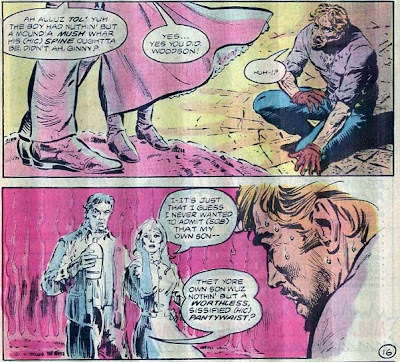 Wilbur is racked with grief over his brother's death and vows to make Jonah Hex pay for what has happened. Meanwhile, back at the state pen, Quentin Turnbull is riding roughshod over Warden Davies, berating him for allowing Jonah Hex to escape prison. Davies points out that even if Jonah gets the letter from the late Gov. Phelps, they can still frame Jonah for the murder of Phelps. Several hours later, Jonah, wounded, is riding across the desert with Wilbur dogging his trail. Sadly for Jonah, Wilbur has a Sharps 74 long rifle (with a range of 500 yards) against Jonah's 30.06. Wilbur lets Jonah sweat it out under the desert sun and at just the right time Wilbur shoots the horse out from under Hex. Jonah gets tossed into the sand and ends up having to finish off his horse. He grabs his canteen and starts walking. Meanwhile, Emmy Lou is trying to figure out where Jonah has gone since he left a week ago and she just keeps getting madder & madder. Back in the desert, Wilbur is conserving his canteen of water and gets the bright idea to relieve Jonah of his supply. Wilbur takes careful aim and just as Jonah is getting a drink, he drills a hole right through that canteen. Jonah claws madly at the sand as his water seeps through his fingers. From a rocky outcrop, Wilbur shouts that he is going to watch Jonah die a slow death. Hex grabs his pistol and fires, but the bullets fall far shy of their target. Elsewhere, J D Hart has located the body of Homer. He knows of Wilbur & Homer and figures that this is some of Jonah's handiwork. JD realizes that he needs to hurry up not just for Jonah's sake, but Mei Ling's as well. While the time has passed, a sandstorm has picked up, blocking out the sun and pelting Jonah with stinging sand. Staggering through the blasting sand, Jonah comes upon a water hole. He drops down and starts to drink when he sees the sign indicating that the hole is poisoned. In a wild rage, Jonah grabs the sign, breaks it in half, tosses it amidst the storm and then curses God Himself. Meanwhile, Mei Ling is lighting candles and praying for the safety of Jonah Hex. The storm has abated as swiftly as it started and Jonah is crawling across the cracked desert floor. He is begging for water when he hears the voice of his father, Woodson, berating Ginny for giving him such a spineless son. Ginny starts crying about how she has failed her husband and Woodson blames all of his drinking upon his tramp of a wife and his worthless son. 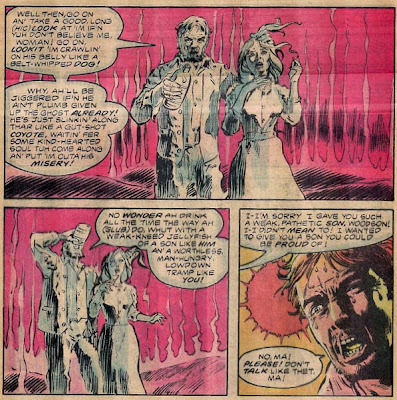 Jonah starts shouting at the hallucination, telling his mother that he can stand on his own two feet and with a strength from center of his being, Jonah Hex stands up in the desert and struggles on. Meanwhile (yup, we're gonna check up on everyone here), Quentin Turnbull is dining as best he can in a western town. He gloats that Jonah Hex will soon be destroyed and that he can return to his own business. Turnbull makes mention of advising President Grant on inflation and debt (placing this, at the latest, between Jan 1877 & March 4th, 1877) . Back in the desert, Wilbur is starting to suffer the effects of the sun as well. He has reached the last of his water, following Jonah Hex in the circles of his wandering. 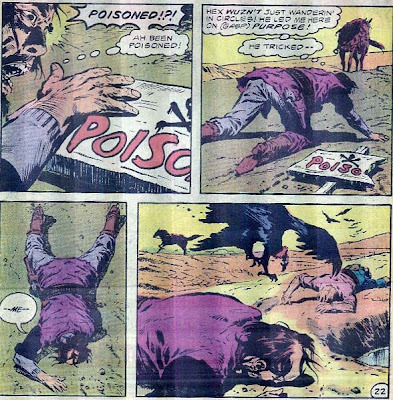 Wilbur comes over a rise and finds Jonah Hex dead, next to a watering hole. Wilbur starts laughing at the irony of Hex being dead just inches from water and he starts gulping down the liquid. Suddenly he realizes how foul the water tastes and he starst getting cramps. That is when he sees the remnants of the shattered Poison sign. Wilbur curses Hex for having killed him and then collapses next to Jonah. Timeline - This one happens all in one day and despite the reference to President Grant, I'll still place this one in April 1878 (maybe Grant still needed financial advice even after he was out of office. From the great cinematic cover to the full page end, this one was one hell of a roller coaster ride. Fleisher kept the suspense up just enough by cutting back to the supporting cast and when Jonah finally had to confront the vision of his dad, it wasn't overly melodramatic, it was just right. Jonah was in a situation where nothing could save him except for his own determination not to die. The only downside to the story was the length that Homer was able to converse after being shot square between the eyes. The poisoned water hole had been used once before, but that was by Albano ten years prior. All in all, one of the best stories there was. Next Issue: Explosions! Electrocutions! Snake Bites! Dehydration! Cheating Hearts! 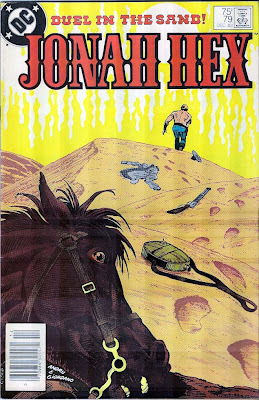 This has always been on my shortlist of favorite Jonah Hex stories, despite the fact that I didn't get the final installment until 13 years after it was published. Great stuff. Woohoo! Shirtless Jonah on the cover! Yeah, Homer really shouldn't have been able to talk at all after being shot dead between the eyes, but I suppose I can forgive a little poetic license. I do have a small question. Isn't Turnbull a Southron? Why would Grant be taking advice from a former Rebel? Why would Turnbull even be GIVING it? Turnbull was also behind a plot to assassinate Grant back in WWT. I imagine that Grant does not understand that Turnbull's motives lie elsewhere and views him only as a sort of captain of Southern industry.